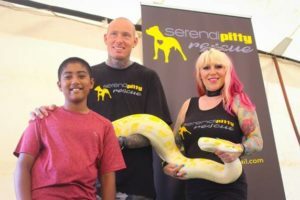 The support of the animal-loving community raised much-needed funds at the Snake City fund-raiser held to benefit SerendiPitty Rescue, a KwaZulu-Natal-based organisation which saves abused, abandoned and homeless Pit Bull-type dogs. Simon Keys and Siouxsie Gillett, recognisable for the snake-rescuing roles on Nat Geo Wild’s Snake City, are avid supporters of SerendiPitty. 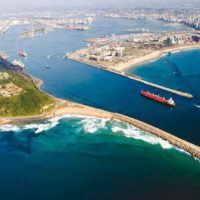 In an effort to raise much-needed funds for the organisation, the two hosted a fun meet-and-greet session at the Amanzimtoti Sports’ Centre at Hutchison Park on Sunday, 3 February. Visitors got the chance to meet the animal-loving pair on the day for a chat, autograph and photo opportunity while also checking out their variety of interesting snake species. The beloved rescued Pit Bull, Oliver, was a popular attraction, welcoming his many admirers to his kissing photobooth for a smooch with the pooch. Established by David Hardwick, Nicole Jack and Candice Webber in 2018, SerendiPitty Rescue saves and protects abandoned Pit Bull-type dogs, providing full medical care, including sterilisation, before the animals are re-homed. The organisation relies solely on public donations. For more information email serendipittyrescue@gmail.com or visit SerendiPitty Rescue and Snake City Fans on Facebook.